Voodoo priests in Haiti are being lynched by mobs who blame them for spreading cholera, the country's government has said. Haiti's communications minister has made an appeal for the lynchings to end and called for a campaign to ensure people understand how cholera spreads. Officials counted 40 people killed - mostly voodoo priests - killed in one region of Haiti, the AFP news agency reported, with five others killed elsewhere. "The victims... were stoned or hacked with machetes before being burned in the streets," communications ministry official Moise Fritz Evens said. Haiti's communications minister said she abhorred the killings and insisted that the answer was to improve general education about how cholera is transmitted. "Voodoo practitioners have nothing to do with the cholera epidemic. We must press for an awareness campaign about the disease in the communities." "Since the earthquake some people have been blaming us, saying that we cast spells and did evil things which brought the earthquake as a punishment," he said. 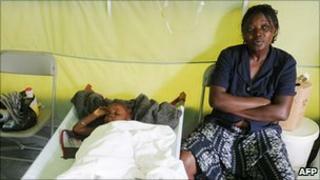 Haiti's cholera epidemic has provoked widespread fear across the country. Anger spread when suspicions emerged that the Nepalese UN peacekeepers could have brought the disease to Haiti - where it is extremely rare - from their country, where it is endemic.